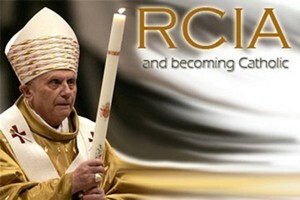 RCIA stands for the Rite of Christian Initiation of Adults. This method of Christian formation which dates back to the primitive Church. RCIA is not a program, instead it is walk gradual process in which one who, after hearing the mystery of Christ explained, freely chooses to follow Christ by entering the way of faith in the Catholic Church. The RCIA Process is broken down into distinct periods, with a formal rite that marks the transitions between these periods. Each step allows catechumens and candidates to reflect on their journey and to discern how they may follow Christ more closely. This initial period is characterized by a come and see  attitude. Those inquiring into the Roman Catholic faith come together as a group and learn the basic outline of the Catholic faith through weekly meetings. It is a time for surfacing questions about the faith and what our it means in our daily living. The Pre-Catechumenate runs from early September to early November, culminating with the Rite of Acceptance. This is the first formal step toward becoming a Catholic.Â Â The Church welcomes you as one on the journey toward full membership in the Church. During this period, candidates and catechumens move through an in-depth look at the faith professed by the Catholic Church. The Tuesday meetings present the different aspects of the Catholic faith in a deeper manner. During this period, the catechumens are asked to attend a Sunday Mass, where they are given a blessing and sent out after the homily to reflect more deeply on the Scriptures that they have just heard. This period lasts until the beginning of Lent and concludes with the Rite of Election. Those who are unbaptized are now called the Elect, or Chosen by God.The Rite of Election marks a decisive point on the journey, where an individual publicly states that he or she intends to become a Catholic. This period continues what began in the Catechumenate, with an emphasis on personal conversion and the development of a personal relationship with God. During this period the Church prays for the Elect in a special way. Before Easter Sunday, those who were previously baptized make a profession of faith and receive the Sacraments of Confirmation and Eucharist. During the Easter Vigil (the night before Easter Sunday), those who have never been baptized are baptized and receive Confirmation and Eucharist. They are now full members of the Catholic Church. This period continues for several weeks after Easter. It is a time when the newly initiated (called neophytes) learn the practical aspects of belonging to a parish and some of the many ways that our Catholic faith can be lived out in the world. For adults desiring to prepare for baptism in the Catholic Church, there is a program called the Rite of the Christian Initiation of Adults (RCIA), which begins with classes and meetings in the Fall and culminates, after a period of much prayer, instruction and discernment, in the receiving of the Sacrament of Baptism at the Easter Vigil. There is also a program for non-Catholic Christians who would like to become Catholic. This involves classes on the Catholic faith and preparation to receive the sacraments of confession, Holy Communion, and confirmation. The sponsor is a person who represents the worshipping community in your parish; your sponsor speaks on the behalf of those assembled at each Rite we celebrate. However the most important aspect of this relationship between you and your sponsor is that you can see it developing into a long-term commitment with each other. This is a person with whom you can share your faith, and other personal aspects of your life.